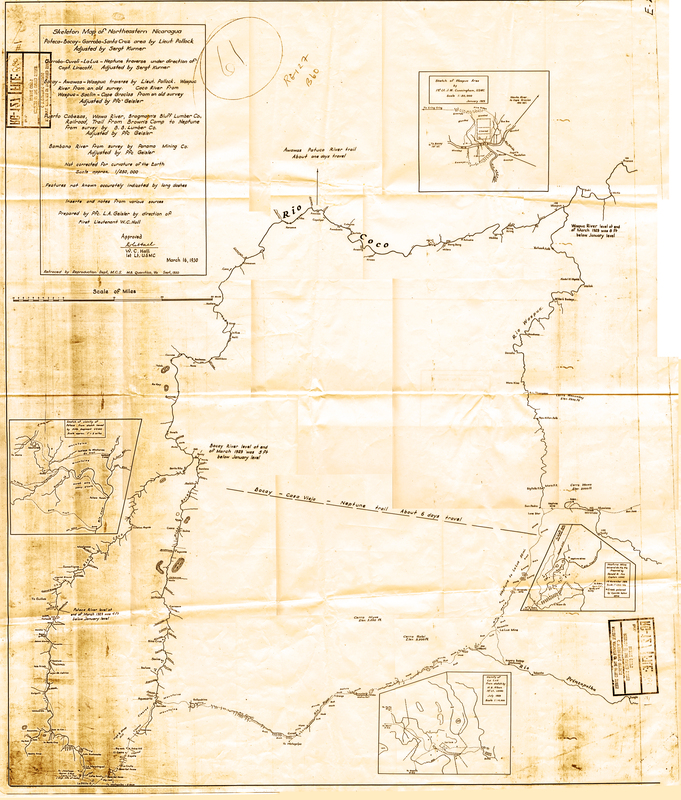 "Skeleton Map of Northeastern Nicaragua, Poteca-Bocay-Garrobo-Santa Cruz area by Lieut. Pollock, Adjusted by Sergt Kurner. Garrobo-Cuvali-La Luz-Neptune traverse under direction of Capt. Linscott. Adjusted by Sergt Kurner. Bocay-Awawas-Waspuc traverse by Lieut. Pollock. 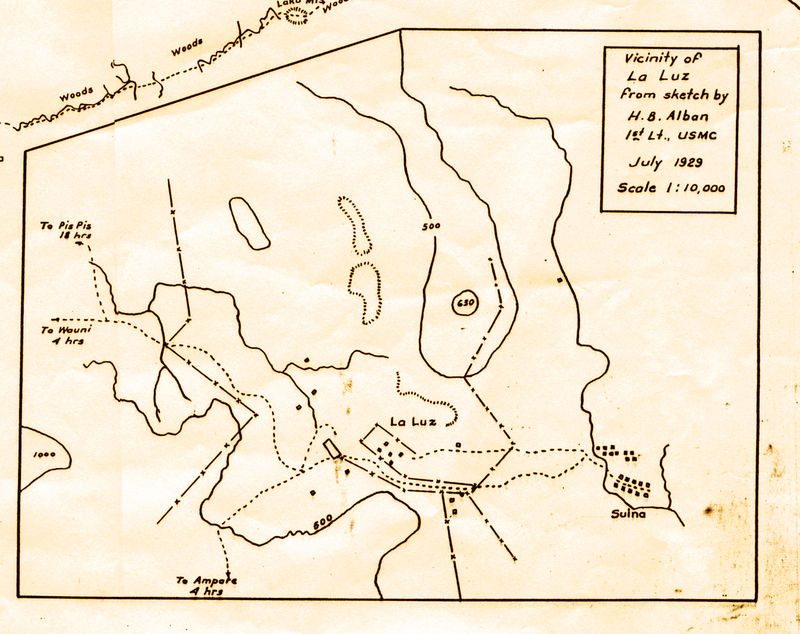 Waspuc River from an old survey. Coco River from Waspuc-Saclin-Cape Gracias from an old survey. Adjusted by Pfc. Geisler. 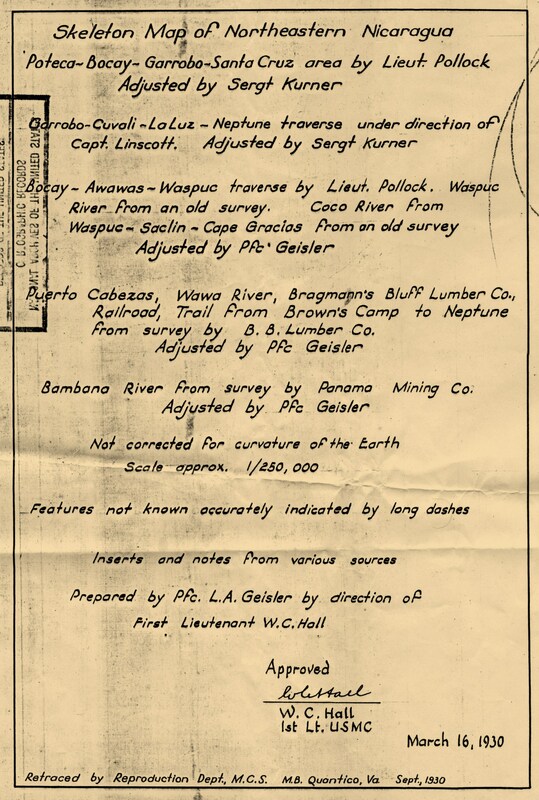 Puerto Cabezas, Wawa River, Bragmann's Bluff Lumber Co., Railroad, Trail from Brown's Camp to Neptune from survey by B. B. Lumber Co. Adjusted by Pfc Geisler. Bambana River from survey from Panama Mining Co. Adjusted by Pfc. Geisler. Not corrected for curvature of the Earth. Scale approx. 1/250,000. Features not known accurately indicated by long dashes. Inserts and notes from various sources. Prepared by Pfc. L. A. Geisler by direction of First Lieutenant W. C. Hall. Approved [signed] W. C. Hall, 1st Lt. U.S.M.C. March 16, 1930. Retraced by Reproduction Dept, M.C.S., M. B. Quantico Va. Sept. 1930." 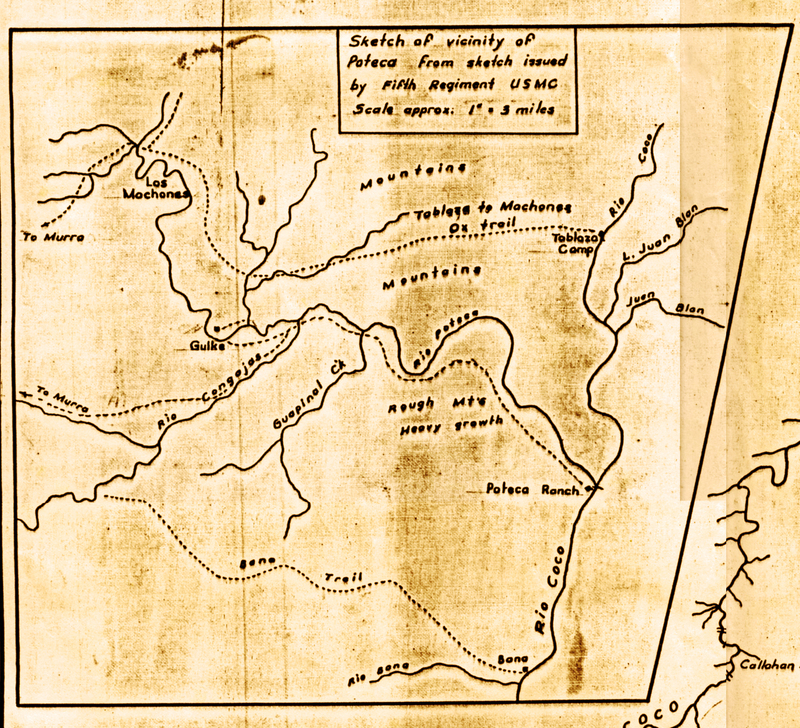 The original map is housed in RG127 in Archives II in College Park, MD and measures 39½" high x 32" wide. The map presented here is a panoramic stitch of scans of a photocopy. 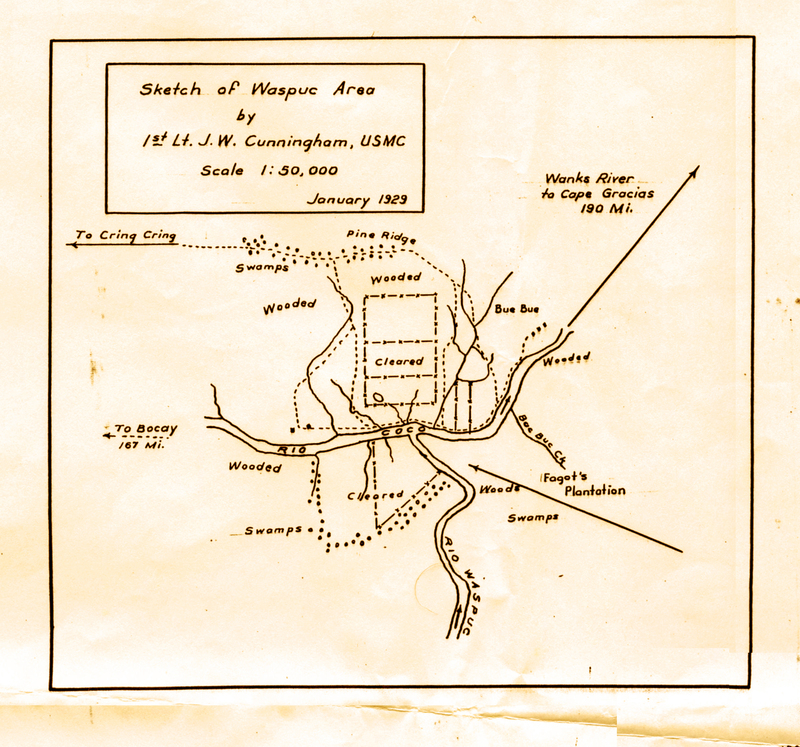 Detail: "Sketch of Waspuc Area by 1st Lt. J. W. Cunningham, USMC, January 1929"
Detail: "Sketch of vicinity of Poteca from sketch issued by Fifth Regiment USMC"
Detail: "La Luz from sketch by H. B. Alban, 1st Lt., USMC, July 1929"
Detail: "Neptune Mine / Mineral de Pis Pis. 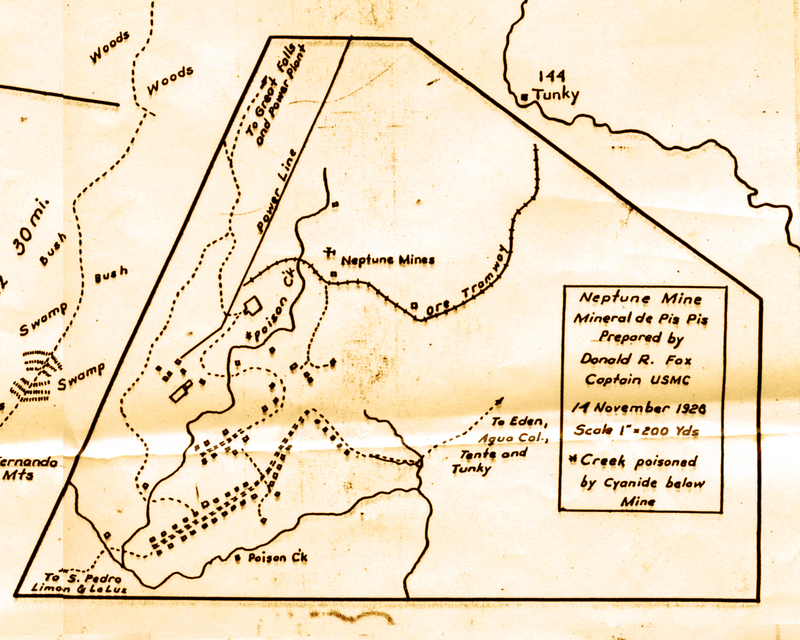 Prepared by Donald R. Fox, Captain USMC, 14 November 1928 . . . Creek poisoned by Cyanide below Mine"